In the late September when the Rose Hips are fully red and ripe and before the first frost gather as many hips as you need for one year. The first step is to wash them them and remove any excessive stems from the bush and the part where the flower was attached. After washing, spread the whole hips on a paper and dry them in the sun or use food dehydrator if the weather is unfavourable. 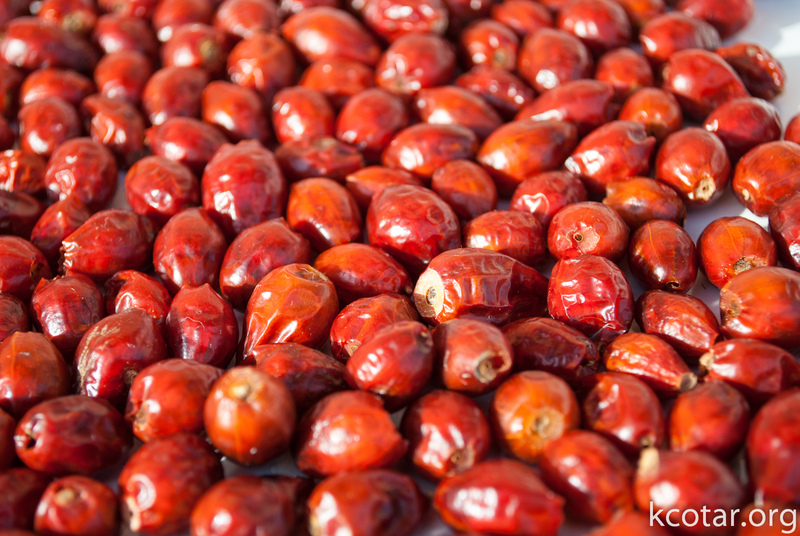 The look of the rose hips after drying, they are wrinkled and hard. 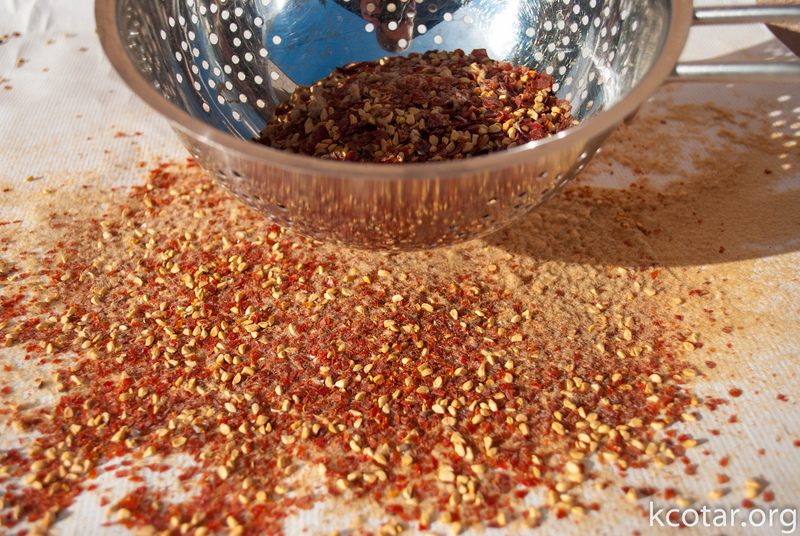 When the drying is complete, put them into the food processor. Do not grind them too small, because the red parts could fall through metal sieve. 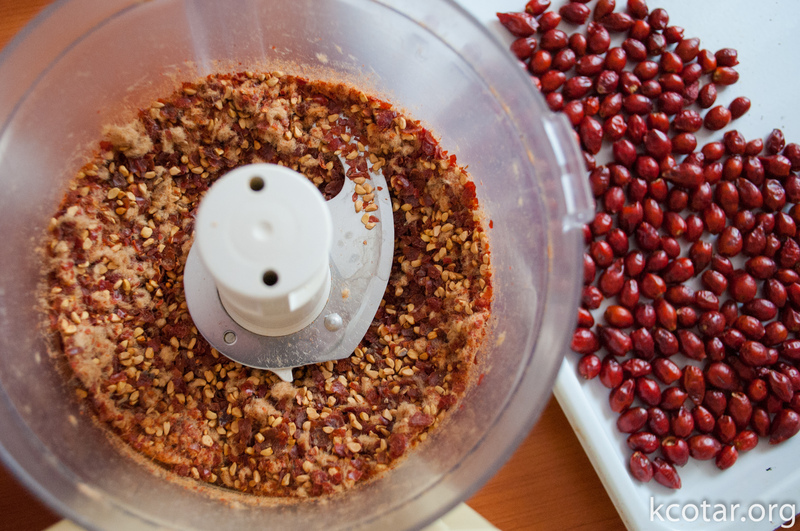 Grinded rose hips in a food processor. Now put the grinded material into metal sieve and shake it to remove the fine white-yellow hairs. They can be easily separated if the hips are thoroughly dried. It is recommended to remove the hairs as they can be very irritating for your lungs and skin. Metal sieve for removing the hairs from the usable stuff. As you can see my first sieve had too big holes therefore I had to use another one with smaller holes to separate all the hair from the dried red hips. There is no need to remove the seeds. 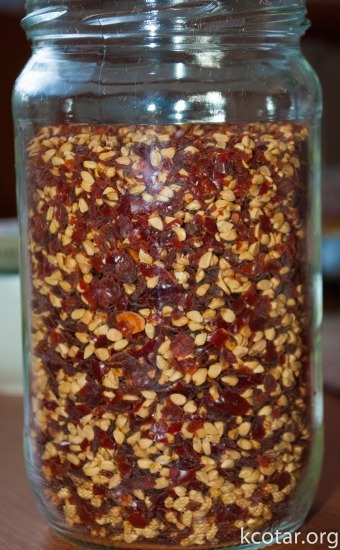 The final step is to put the dried rose hips into a airtight glass jar. Dried rose hips stored in a airtight glass jar. To make a tea use a teaspoons of dried hips for every cup of boiling water and steep for 10 to 15 minutes. Sweeten with honey and enjoy.